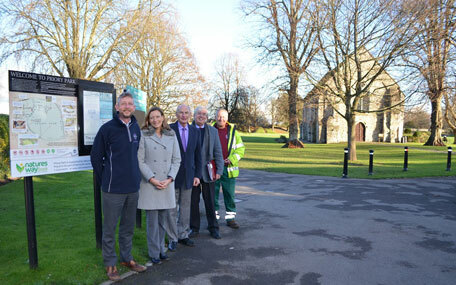 Improvement works have been carried out to Priory Park in Chichester ahead of this year's centenary celebrations. The work has involved installing new railings which replace an old wooden fence which had deteriorated. The idea of new railings was raised several years ago by the Friends of Priory Park, a voluntary group set up to promote, conserve and protect the park. The work has been funded with money from developer contributions known as Section 106. Historic England has also been involved in the planning stages of the project. The work has been completed ahead of the park's exciting centenary celebrations which are being organised by the Friends. Councillor Tony Dignum, Leader of Chichester District Council, says: "As well as improving park security, the railings are also aesthetically pleasing and fit in with the heritage surroundings. Although some hard pruning has been carried out to allow the work to take place, the gaps in the vegetation will disappear over the coming seasons, aided by some extra plants. "We are very much looking forward to the Friends' programme of events to mark the park's centenary. We are also grateful to Natures Way Foods which has just come on board as the park sponsor - so a double celebration for Priory Park this year!" Stephanie Jones, Business Insight and Communications Manager of Natures Way Foods, says: "We are pleased to be sponsoring Priory Park as it offers so many opportunities for people to come together and be part of their community. As a local company we know how important educating our young people is and we also recognise how vital it is for people to keep active, whatever their age. Parks offer a unique environment in which to do this." For the centenary celebrations, a wide range of activities will be taking place through the year. In September, there will be a nine-day festival of activities which will mark 100 years to the day since the 7th Duke of Richmond gave the park to the people of Chichester, to honour those who had died in the First World War. The first event takes place on April 24 and will be a talk about the park's history, called Priory Park 100: Romans, Roundheads and the Rolling Stones. The September programme will involve a wide range of activities to reflect the history and uses of the park over the years. Friends Chairman, Councillor Richard Plowman, says: "We are very pleased that our idea for the new railings has been completed. It really sets the park off well and is in good time for our Priory Park 100 celebrations. "Generations of residents and visitors to the city have made Priory Park their own through a variety of activities and events that have taken place within its walls. We hope that our vibrant programme of events will offer something for everyone and as well as celebrating the park's history, will play their part in creating memories for the future."